"A clear and present danger to our country." ''Xenophobia, racism and misogyny." ''Beneath our national dignity." Those aren't excerpts from attack ads by Hillary Clinton's campaign. Those are longtime Republican newspapers disavowing Donald Trump. 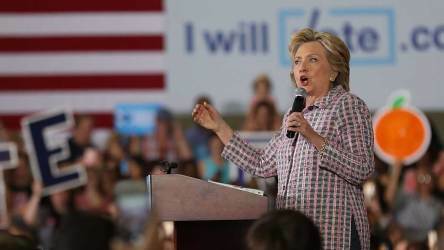 If newspaper endorsements equaled victory, Clinton would be in line for a historic landslide. She has been endorsed by dozens of papers ranging from such expected backers as The New York Times to such once-certain GOP advocates as The Dallas Morning News, the Arizona Republic and the Cincinnati Enquirer, which on Sept. 23 called for "a leader who will bring out the best in Americans, not the worst." On Friday, USA Today ended its tradition of not taking sides and published an anti-endorsement, contending that Trump "lacks the temperament, knowledge, steadiness and honesty that America needs from its presidents." The paper didn't back Clinton but advised readers to "Stay true to your convictions." The same day, The San Diego Union-Tribune endorsed Clinton — the first Democrat it has endorsed in its history. Trump scorned the negative editorials Friday, tweeting that "The people are really smart in cancelling subscriptions to the Dallas & Arizona papers & now USA Today will lose readers! The people get it!" "I don't read USA Today," he said later to WZZM13 in Grand Rapids, Michigan. "It's not much of a newspaper as far as I'm concerned." If Clinton's overwhelming advantage among editorial boards mirrors the revulsion Trump has inspired from officials in both parties, the endorsements may also illustrate the decline in newspapers' power to shape opinions and the strength of Trump's anti-establishment appeal. Polls show Clinton trailing in Texas, Arizona and Ohio despite the unexpected support of GOP papers. During the primaries, the venerable conservative paper the New Hampshire Union Leader endorsed Chris Christie, only to have the New Jersey governor lose the state decisively, drop out and back Trump. The Arizona Republic favored John Kasich in the state's GOP primary, but Trump won easily, and the Ohio governor finished fourth. "Newspaper endorsements don't have nearly the impact they used to," says Mark McKinnon, co-host of Showtime's political show "The Circus" and a longtime adviser who has worked with former President George W. Bush and Sen. John McCain of Arizona, the GOP's 2008 presidential candidate. "There are just way too many other sources of information for voters today." "They are just part of the wave," says political historian Rick Perlstein, who is in the midst of a multivolume series on the rise of the conservative movement and has written in depth about elections of the 1960s, '70s and beyond. "They don't start anything, and probably didn't determine much — but betoken a widespread disgust in the air." Readers may not let editorials tell them how to vote, but they care enough to respond. Dallas Morning News editor Mike Wilson recalls a group of about a dozen people demonstrated against the endorsement across the street from the paper. Wilson went down to talk with them. In a series of tweets, he described a discussion that began angrily but settled into a serious dialogue. "I got a few words in and persuaded zero people," he tweeted. Wilson said he's received some messages from Clinton supporters thanking the newspaper for the editorial, but hasn't heard that it changed anyone's mind. "They're not really meant to end arguments, they're mean to start discussions, and this one certainly did that," he said. "One of the reasons we exist is to take editorial positions on things that can improve lives in our community," he said. "That is one of the core functions of a newspaper." Peter Bhatia, editor and vice president of audience engagement at the Cincinnati Enquirer, said he knows that the impact of editorial endorsements has lessened. "The days of people taking the endorsements of an editorial board and going into the polling place with them are pretty much long gone," he said. But he still considers it an important obligation. The newspaper's editorial board came to consensus pretty quickly so they decided to get it out. As anticipated, some readers lashed out. Bhatia said he received some 150 angry emails and there were some canceled subscriptions. "I am impressed by how thoroughly rehearsed some of the attacks on Hillary Clinton are," he said. "They have a very familiar bent to them." He also cites their incivility, but doesn't find that unusual in the internet age. He said there also have been a few dozen positive notes. He said he gave an interview to CBC radio in Canada and got a long email from someone who found his arguments convincing. Just one problem: The person lives in Canada and can't vote.